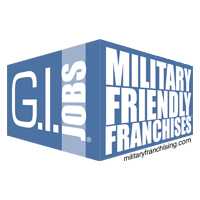 Being selected as a Military Friendly Franchise places The Dwyer Group in this elite group, and is testimony to The Dwyer Group’s world class programs and policies that support military veterans interested franchise opportunities. The Dwyer Group today announced that all seven of its brands were ranked in the top 10 percent of all franchises nationwide and named a 2012 Military Friendly Franchise® by G.I. Jobs Magazine. The Dwyer Group is a group of service-based companies known for its depth of support services, respected management team, commitment to the company’s Code of Values®, and the success of its franchises. The company’s brands: Aire Serv®, Glass Doctor®, Mr. Appliance®, Mr. Electric®, Mr. Rooter®, Rainbow International®, and The Grounds Guys®; honor military veterans all year round by offering service members 25% off the initial franchise fee, allowing veterans to use their training and operational skills in a new civilian career. Don Dwyer, founder of The Dwyer Group, started the VetFran program at the end of the first Gulf War in 1991. Through the International Franchise Association (IFA), over 400 franchisors have joined in offering financial incentives to veterans through VetFran. The Dwyer Group has awarded more than $1.3 million in financial discounts to 254 VetFran franchisees within its brands, including 17 new franchisees in 2012 to date. The Dwyer Group, Inc., based in Waco, Texas, is a holding company of seven franchise businesses, each selling and supporting a different franchise under the following service marks: Aire Serv®, Glass Doctor®, The Grounds Guys®, Mr. Appliance®, Mr. Electric®, Mr. Rooter® (Drain Doctor® in the UK and Portugal), and Rainbow International®. Collectively, these independent franchise concepts offer customers world-wide a broad base of residential and commercial services. In addition, Dwyer operates glass shops in New England under the Portland Glass brand name. The Dwyer Group is a portfolio company of TZP Group LLC, a private equity firm based in New York that focuses on control investments in business and consumer services companies with enterprise values generally up to $200 million. More information on The Dwyer Group, or its franchise concepts, is available at http://www.dwyergroup.com.